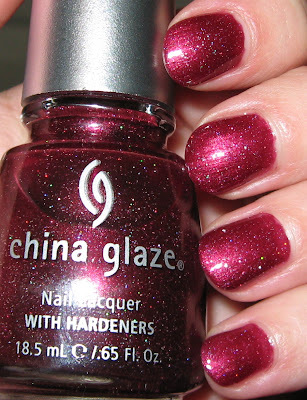 Above & Below: China Glaze Crystal Ball shown with a flash indoors, above. Below is outdoors in the rain, no flash. I used 2 coats and no top coat. 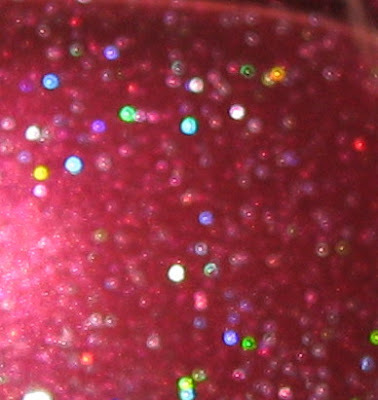 Below: Blurred photo of the finish to show you how the micro-glitter changes colors. Below: This is one coat of Dripping Wet over Crystal Ball. It darkens the colors without hiding the micro-glitter in Crystal Ball for a glowing effect. 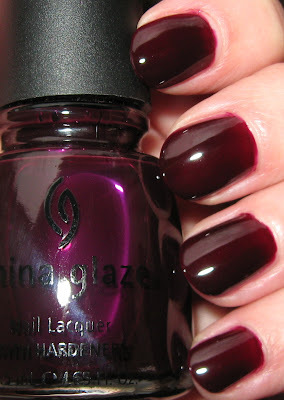 Below: Dripping Wet is a jelly finish in a very deep burgundy or blood red. I normally use 3-4 thinner coats, as the color initially goes on as almost a raspberry shade, but builds deeper upon each coat. Tomorrow is the start of Body & Soul's Friday Follower Freebie (details on entering are in the upper right side column), so I thought it might be a good idea to show you the 2 China Glaze polishes that are going to be won by 2 lucky followers. As I mentioned earlier this week, Dripping Wet and Crystal Ball are some of my favorite discontinued China Glaze Shades. My reasons for loving them are varied, but I actually like these for two for quite opposite reasons. They are both in the burgundy family, but still very different. Dripping Wet makes a bold statement. It's dark and vampy, most definitely a jelly finish, dark enough, but still light enough that it looks like a very deep, blood red without ever looking black. 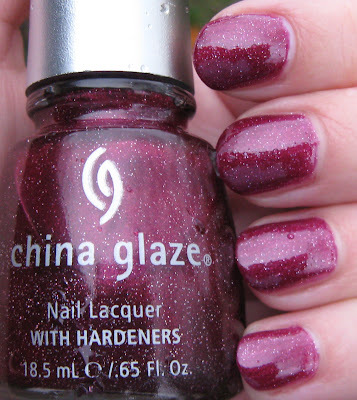 Crystal Ball on the other hand, is a more demure shade, a much lighter burgundy than Dripping Wet, but the ever changing micro-glitter fancies it up just enough to make it a definite eye-catcher without looking like a full-blown glitter. Both are absolutely gorgeous! .) And they look so nice on you Mary! Wow is all I can say! Your nails really really look gorgeous! I'm insane about Dripping Wet. I don't have that beauty. That's one I really need. Hope I win this contest! My favorite way to use Dripping Wet is layered over a holographic glitter with large particles, over a black base. 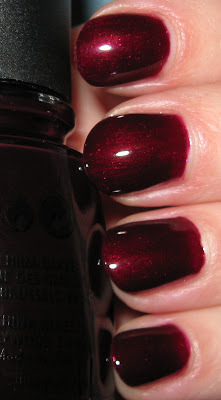 With one coat, it adds depth and the glitter flashes through the burgundy veil like a deep, dark opal. It is just stunning and preserves more of the precious d/c polish by only using the one coat. WOW! Those are insanely beautiful. And your contests just keep getting more and more awesome!! BTW, I love how you decorate your site for the season, loved your T'giving and Halloween but am especially loving your Christmas deocrations! So pretty and festive. Those are both gorgeous! I can tell why you like them so much. These are beautiful, why is it they always discontinue the BEST polish colors? Dripping Wet is making me droool!!! Ooo, those look beautiful!!! I love both of them! These colors look beautiful on you! I don't know why these colors would be discontinued?! Thanks for all of the comments and I apologize for getting so behind on answering them! I agree with those who wonder why they discontinue some of these fantastic shades. I don't know what rationale they use, but there are lots of shades I love that have been discontinued, and other I wouldn't think would be that popular then become part of the core line, so who knows.